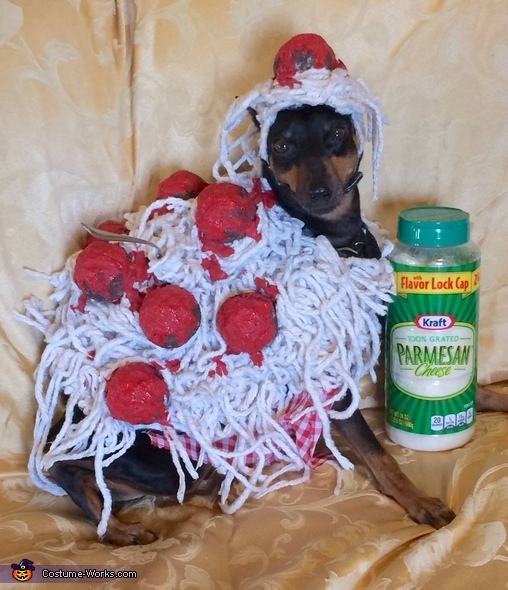 Jabez is pretty well known around here as Mr. Spaghetti and Meatballs. He wore this costume in a pet parade and costume contest in which a couple hundred other dogs also participated. We couldn't walk more than a few feet without stopping for pictures. People would be kneeling down in front of him to take his picture about every 10 feet. I felt like I was walking Jabez on the red carpet! Jabez would stop and pose for everyone with a big smile on his face. He tied for 1st place in the small dog category. I started with a black fleece jacket vest from a dog coat pattern that I had. I glued a piece of red and white fabric to the vest to look like a table cloth. I bought 2 string mops which I took apart and glued onto the fabric. The meatballs were made of styrofoam balls which I pressed indentations into so they would look like handmade meatballs. I painted them "meatball" brown and glued them onto the spaghetti. I drizzled "spaghetti sauce", which was made of mod podge and red acrylic paint, over the top. A fork was added for extra effects. I made him a matching spaghetti and meatball hat.